Yuma High Interact Club Helps Out Food Bank! 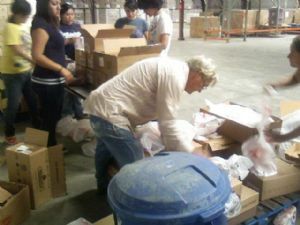 Thirteen Yuma High Interacters along with Fort Yuma Rotarians Robert Rolle, Robin Newman, Brian Geren and Brian's brother Geoff Howerton, volunteered over the weekend at the Yuma Community Food Bank. The young students took three hours out of their Saturday to create 600 Harvest Club meat bags, saving the Food Bank staff eight (8) hours of work; marked 1000 lbs of breads and pastries; and two students' stuffed 300 envelopes after they folded the flyers for the Annual Food Bank Golf Tournament. All these activities may seem minor to the students, the impact it has made on the Food Bank is essential. Thank you Yuma High Interacters!